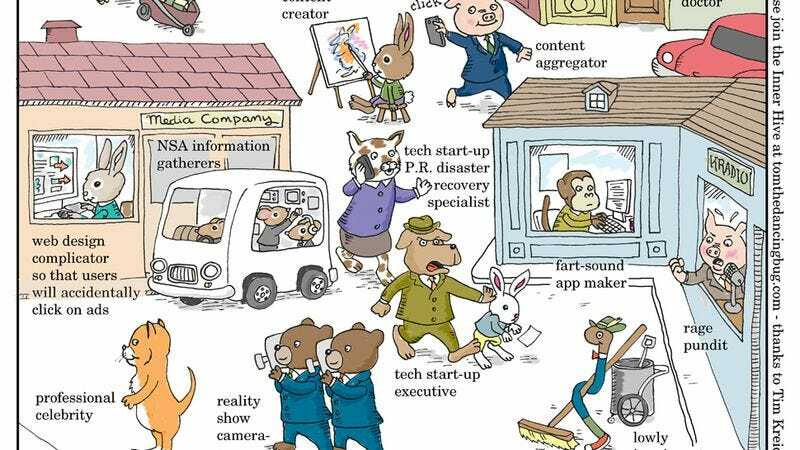 Richard Scarry’s Busy Town books have always been a comforting look at all of the different professions that go into making a city of anthropomorphized animals tick. They’ve always been nice, but in the 21st century, they’ve become more and more archaic. Does anyone know any cats who are construction workers in the year 2014? What rabbit works as a taxi cab driver anymore? Sensing a need for an update, Ruben Bolling has released his vision of a contemporary Busy Town for his Tom The Dancing Bug comic. In this version, the butchers and doctors of the world are gone, replaced by super PAC money launderers, professional celebrities and content aggregators. It’s a harsh (but not entirely inaccurate) depiction of all the hard work that goes into making a Busy Town busy in 2014.